Smoking a cured ham gives the ham a double smoke. 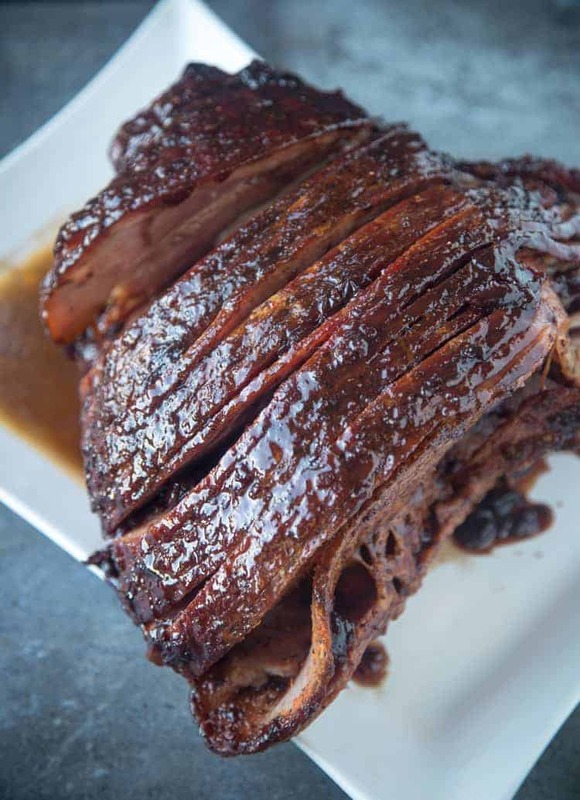 This cherry bourbon glaze takes a smoked ham to the next level giving it that extra wow factor! 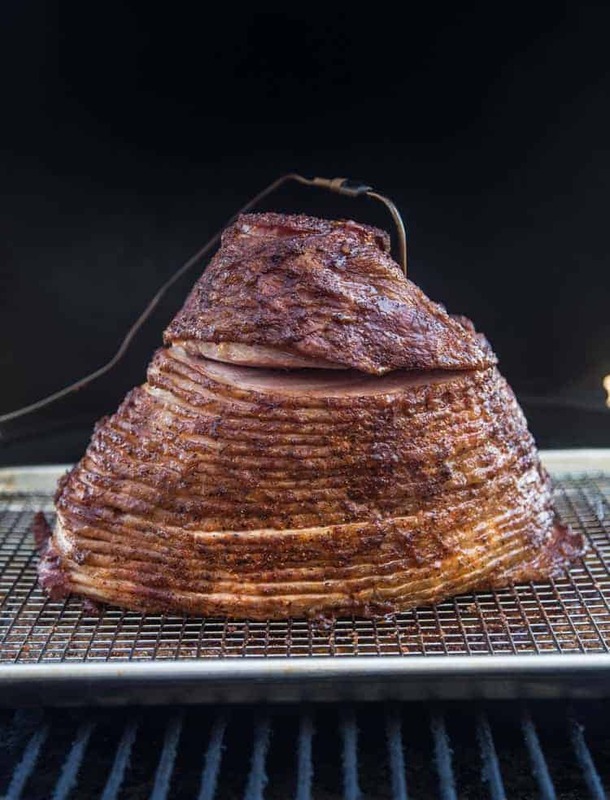 Find out how to double smoke your next holiday ham. I wasn’t much of a ham person growing up. We had one every year for Easter and often Christmas, but it just wasn’t my thing. It always ended up dry and boring when cooked in the oven. But cooking it in the smoker gives it so much added flavor, and when you ditch the packaged glaze that comes with your store-bought ham and replace it with your own it’s off the charts! I’m more than happy to reintroduce ham back into my holiday lineup with this double smoked ham! The Cut – What is Ham? When learning how to cook a smoked ham, I think it helps to start with what type of ham this works best on. The ham comes from the rear portion of the pig versus the pork shoulder. 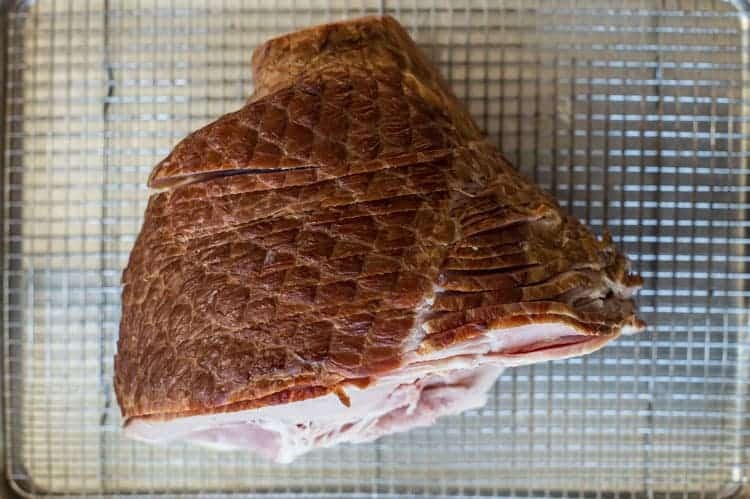 If you simply buy a ham and smoke it, you will get a very similar characteristic to a shoulder. In this post, we are referring to the same cut, but one that has been wet cured. Wet cured you may ask? Well there is dry cured, which is in a salt or salt and sugar combo. Think prosciutto as an example. And there is a wet brine. This is what you will see often in the US which is when the ham is injected or immersed in a liquid brine and often smoked. We like to buy a ham that is wet brined and already cut or spiralized. The slices will allow glaze and rub to get into the meat and makes for an easy cut when done. In addition to the wet brining, what you will see in the store is often smoked once and precooked. So by smoking to reheat a second time, we get the twice smoked ham component we want for flavor. We’re adding big flavors to our ham so we start by adding Dijon mustard to provide something for the rub to stick to. We then coat with a dry rub to give it some bark as we smoke it. 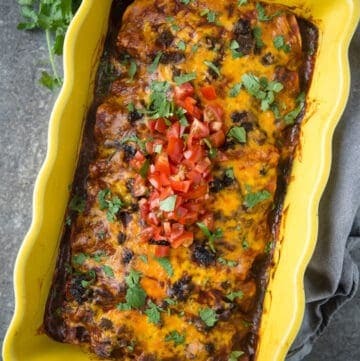 This will also add great outside flavors and a slight crunch. 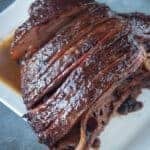 Finally we will finish with our sweet and savory cherry bourbon glaze which will slightly caramelize and give that nice added flavor to the finished ham. 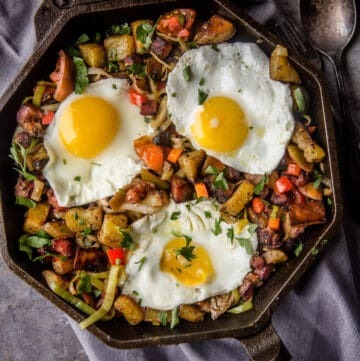 Simply add black cherry jam, brown sugar, bourbon, apple cider vinegar, Dijon mustard, salt, and allspice into a small saucepan and bring it to a simmer, whisking often to let everything combine. The cherry jam will have small chunks of cherries in it, which will show up on the glaze. If you wish for a smoother glaze feel free to use a food processor to mix up the glaze so it’s smooth, not chunky. The glaze can be made in advance, then warmed up before applying to the ham. 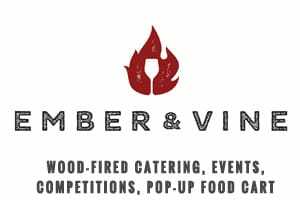 We use fruit wood and smoke at a temperature between 225 and 250 degrees Fahrenheit. After coating the ham with your Dijon and dry rub, you can place the ham on a tray, like in the photos, or directly on your grill grates. For ease of transferring we like to use a sheet tray. If you have one, place a temperature probe alongside the bone, but not touching to monitor the internal temperature of the ham. We like using the Smoke unit by Thermoworks for a ham this size. 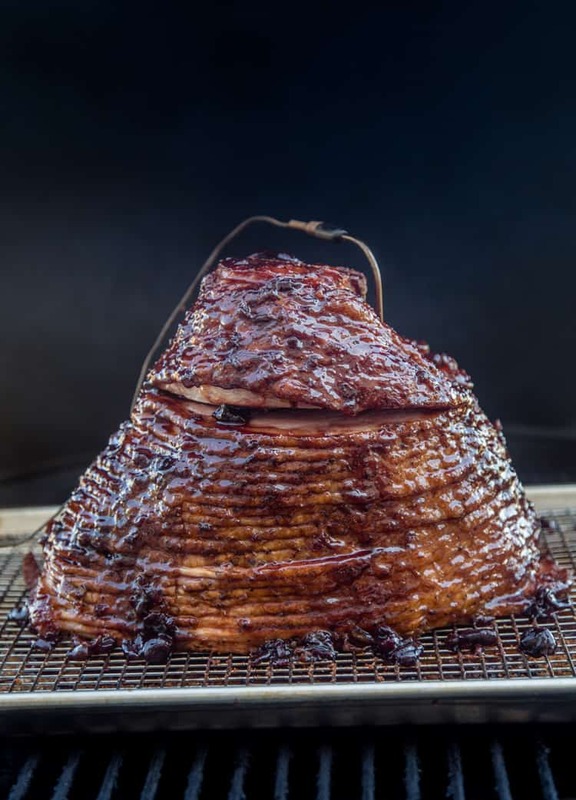 What is important when cooking a smoked ham, is keeping temps low and cooking it until the ham reaches an internal temperature of 130 degrees, and then glaze it. Glaze the ham once, then close the lid and continue cooking until the ham reaches 140 degrees, and then pull the ham from the smoker. 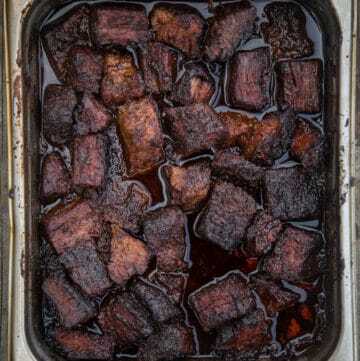 If you add the glaze too soon it runs the risk of burning. When you add it towards the end you get that nice bark from the dry rub, and then finish with that satisfying bourbon and cherry flavor. 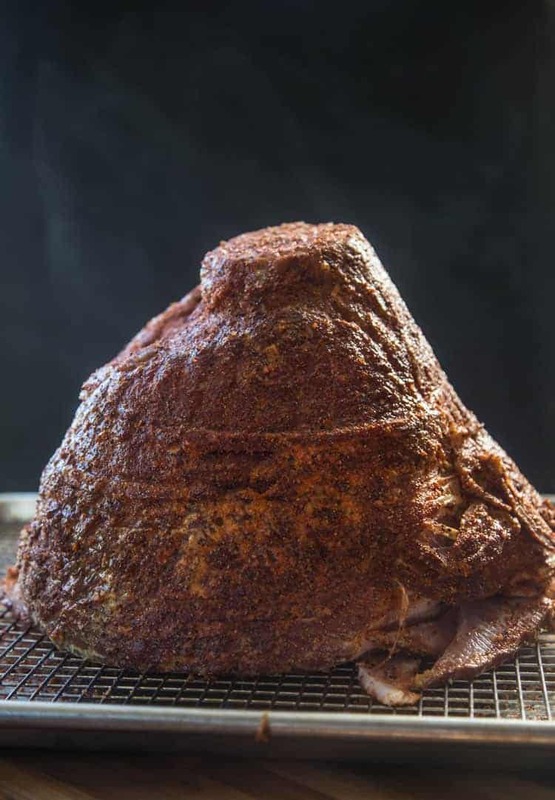 We find this is the best way to smoke a ham for ultimate flavor. Once you remove the ham from the smoker immediately apply one more coating of the glaze and let it set. Serve warm. 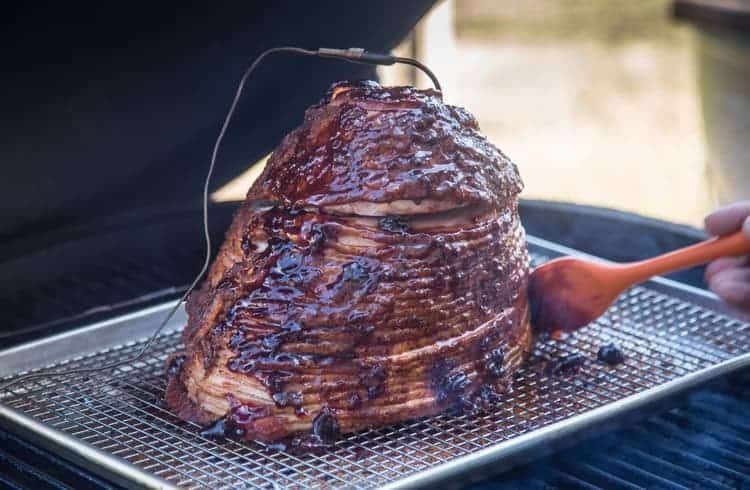 A double smoked ham with cherry and bourbon glaze. The ultimate holiday ham! In a small sauce pan over medium heat, add all ingredients and bring to a simmer. Continue to simmer for 10 minutes and remove. Let cool. Will thicken as it cools. Can be made in advance. Reheat slightly before applying. Preheat smoker to 250 degrees Fahrenheit using fruit wood (we like cherry). Coat ham with Dijon mustard and liberally apply dry rub, and place into smoker on a sheet pan or in a small aluminum pan (uncovered). Insert a digital meat thermometer temperature probe if you have one. Smoke at 250 until the internal temperature of the ham reaches 130 degree Fahrenheit. Glaze the ham with half the glaze. Close the lid and continue cooking until your internal temperature of the ham reaches 140 degrees. Remove from smoker and glaze the ham with the remaining glaze. Let sit for 20 minutes and serve. We use our Ultimate Dry Rub for this recipe. Most folks are usually enjoying a ham for a holiday meal with family and friends. There’s likely going to be a lot of different flavors in the mix, much like Thanksgiving, so we don’t need to freak out about something perfect for just the ham. White wines can be great with ham, but a bit trickier with this glaze and dry rub. But those that fit the bill include a dry-ish Riesling or Chenin Blanc. 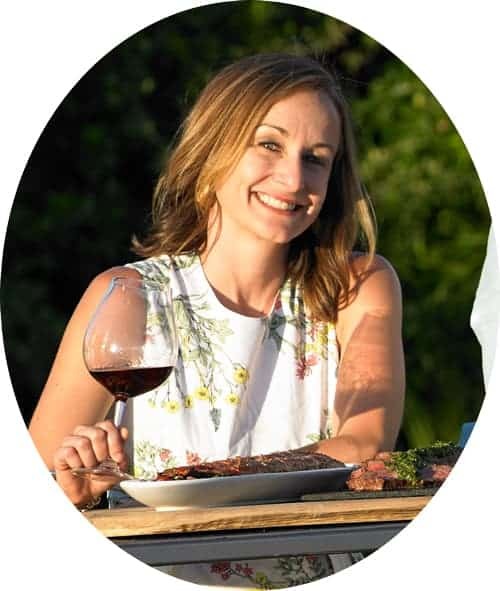 For reds shoot for something fruity like Beaujolais or new world Pinot Noir. 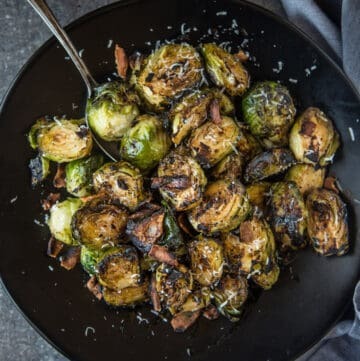 With the bold flavors of the glaze you can even reach for a Zinfandel. It would be great with this! 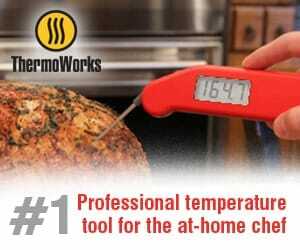 *This post contains affiliate links for Amazon and the ThermoWorks Mk4 Digital Thermometer. We only recommend products we use and love! And all of the products mentioned above are those we use regularly. This is a fascinating post – there are so many little details I was oblivious to. I also have not been a big ham person, and have found it dry and tolerable the handful of times I’ve encountered a spiraled ham at a family dinner. And what is it about smoked meats and cherry that is such a successful marriage? I love all your suggestions and will keep them in mind. Thank you! It is true that cherry and smoked meats is a divine combo! time to learn how to smoke! Well, you did it again: Developed yet another awesome recipe! I just shared your blog with a friend who got a smoker last weekend. She’s so excited to try your recipes! Absolutely you can do this with a half ham shank. Consider cutting the total cooking time. Pre-slicing isn’t required, but makes a much easier serving when done. Can the ham be baked in the oven instead? I don’t have a smoker. Absolutely, I would still go low so you don’t dry out the ham. Maybe 275, it won’t take as long. Then add glaze at the end. Thanks Sean! 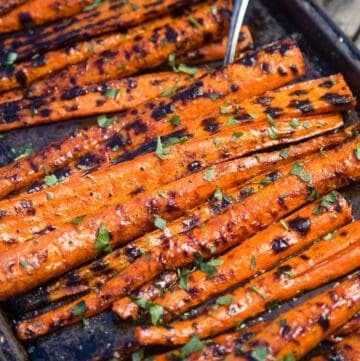 I’m going to make this for dinner on Sunday, looking forward to tasting it. Have a great Easter weekend. Tag us in the photos you will share!!! Have a great Easter! Can’t find blackcherry, only cherry any way I can sub it or fix the difference? Totally fine using the cherry!! !